My husband’s favorite dessert is chocolate pie. His grandmother was a wonderful southern cook, and chocolate pie was one of her specialties. So Jonathan grew up eating what I refer to as “heirloom” chocolate pie, because apparently one must inherit the ability to make it like she did. I have tried, but goodness knows I just can’t make it like she did. Instead of always feeling like my chocolate pie was inferior, I decided to find a chocolate pie that was entirely different than hers. 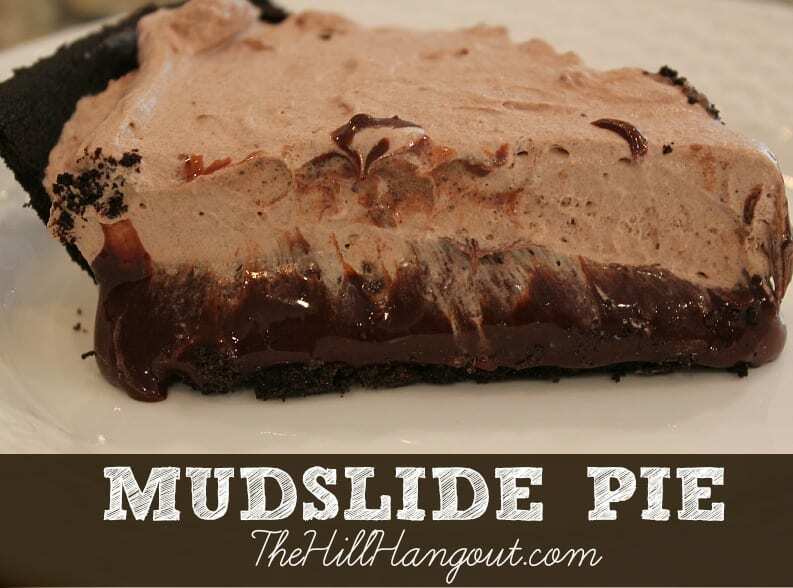 I came across Mudslide Pie years ago, and it has become a treasured part of the holiday dessert collection around here. Hardly a holiday goes by that one of my gang doesn’t ask for it. I made it last weekend for Easter, and decided to pass it on to you. I hope your family loves it as much as mine does. Melt a cup of chocolate chips in a saucepan over lowest possible heat. As it melts, stir with whisk to smooth chocolate. When completely melted, remove from heat. Combine coffee granules and hot water in a medium size bowl. Add sugar, sour cream, and vanilla. Stir until sugar is dissolved. Stir in melted chocolate until smooth. Spread into pie crust and put in freezer for several hours. When pie is chilled, you can make the topping. Beat whipping cream, powdered sugar, and cocoa in a small bowl until stiff peaks form. Spread over chocolate layer in pie crust. PLace pie back in freezer until ready to cut. Chocolate, coffee, and sour cream make this frozen pie a delight!